► Send us your reader spyshots to feature here! 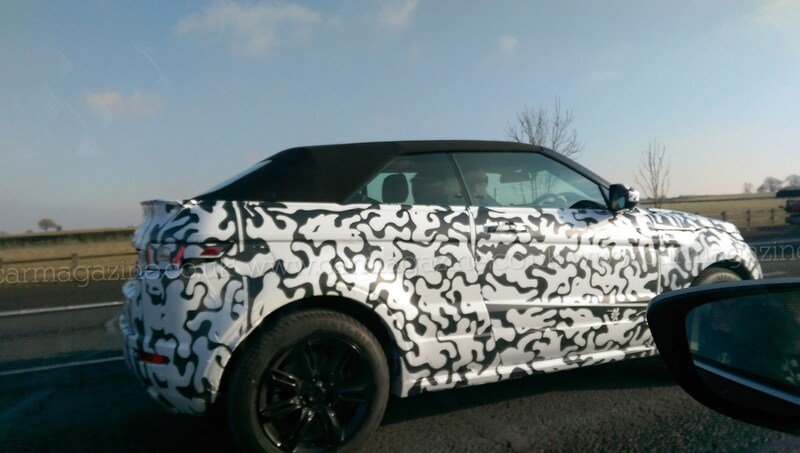 CAR reader Chris Freshwater has spied the upcoming Range Rover Evoque Convertible heading towards JLR’s Gaydon HQ on the M40. Hats off for the close-up shot – it neatly illustrates just how deep-sided the fabric-roofed 4x4’s body proportions will be. There’s a really quite extreme body-to-roof ratio going on here. The bootlip spoiler appears quite prominent close-up too, not to mention that amazing gingerbread man motif camouflage stickerwork, which reminds us of artist Keith Haring’s work. It’s not the only interesting camouflage we’ve spotted recently – check out our guide to the cleverest camouflage methods car makers use to protect their prototypes from prying eyes here. As Freshwater’s cameraphone spy photos show, the drop-top Evoque is based on the coupe version’s three-door shell and is likely to be a four-seater. Under that canvas roof there won’t be a fixed rollover bar to clutter that arrow-straight shoulder line but a neat pop-up pyrotechnic set-up instead, as per the VW Golf and Audi A3 cabrios. When will the convertible Range Rover Evoque be launched? We’re expecting production to start in 2016, with pricing likely to start upwards of £40,000. Read more about the Range Rover Evoque Convertible in our original spy shot story here.